In just a short number of years, mobile technology has completely changed the way we find information and entertainment, communicate with friends and family, and get things done. Having a supercomputer in our pocket is now second nature; today more searches on Google come from mobile than from desktop computers, and by some estimates there are more mobile devices than there are people on the planet. 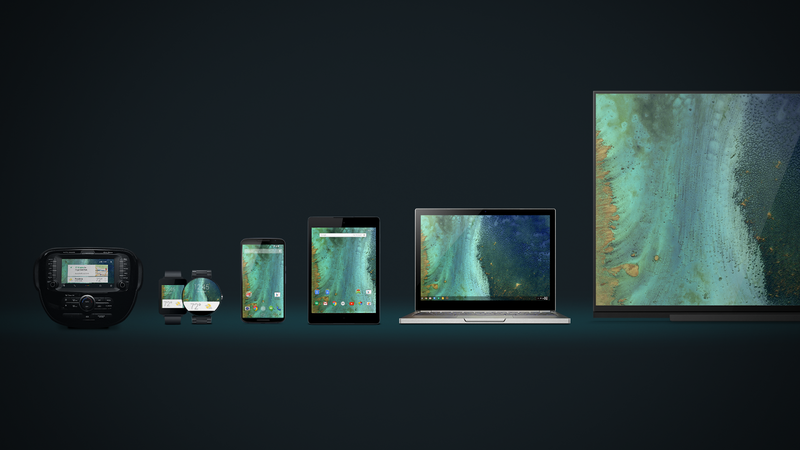 For evidence of the mobile revolution, look no further than the growth of Android. There are now more than one billion Android users worldwide—a long way from when we launched the first Android phone back in 2008. And there are 4,000 unique Android devices on the market, from more than 400 manufacturers and over 500 carriers. The devices themselves have changed a lot, too. In today’s multi-screen world, you can now use Android on your phone, your tablet, your wrist, in your car and in your living room, and move seamlessly between each. Many of these new form factors have arrived just in the last year. You can now choose from seven different Android Wear watches, not to mention bands, styles, and more than 1,500 watch faces built by developers. By the end of this year, 35 car models will offer Android Auto, helping you access Search, Maps, music and other information through your car’s controls. And the first sets running Android TV have now arrived. With all of these new places and devices for people to use Android, developers have even more opportunities to build the apps that people use for education and engagement and entertainment. So today we talked about the new tools and features we’re giving them to build more powerful experiences on the Android platform. Android M is the most powerful Android release yet, with hundreds of improvements made to the platform. Among the highlights, we’ve improved battery life and streamlined permissions for apps to make it easier for you to decide what information the apps on your phone can use. We previewed Android Pay, which lets you pay for things with your phone, without even opening an app. And we’re making it much easier to find information in apps, as well as making some important updates to Google Now (more on that below!). Your mobile phone packs a lot of information, but it’s not always easy to find that nugget of information when you need it—as you know if you’ve ever tried to navigate your email, organize hundreds of photos across devices, or search for restaurant reviews when you’re chatting about dinner plans with friends. Luckily, finding and organizing information is something Google is good at (some might even call it our mission). So as part of M release, we’re expanding Google Now to give people on-demand assistance in the moment they need it—like seeing if there’s an open table at a new restaurant or when and where “Pitch Perfect 2” is playing—no matter where you are on your phone. We’re also making it much easier to find new apps and in-app content—which is good news for both users and developers. We’ve also put our years of research into machine learning to work in other ways, making Search more useful and your inbox more insightful. And now it’s also helping you make sense of all your photos. Today we launched a new Photos app that gives you a single place for all your photos and videos, and helps you sort through them more quickly, bring them to life in cool new ways, and share them however you choose. But many roadblocks remain—the user experience is inconsistent and confusing, manufacturers often redo their work for every device, devices don’t interoperate, and developers often have no way to create great experiences across devices. Enter Project Brillo, a new platform derived from Android that lets developers and manufacturers build connected devices. As part of Brillo, we’re introducing a communications protocol (Weave) developed in partnership with Nest, a set of developer APIs, a core set of schemas and a certification program to ensure device and app interoperability. Although it will launch later this year, we previewed Brillo today because we’re committed to fostering a vibrant ecosystem in which we all work together to move the industry forward. Mobile has evolved so much in the past few years, with connected screens for different experiences depending on your needs. But we are just at the start of what will prove to be a much more immersive mobile experience. At last year’s I/O we introduced Cardboard, which lets you turn your phone into a virtual reality experience. Now there are more than 500 Cardboard apps for film, games, tours and learning, and more than 1 million Cardboard viewers have been shipped. Today we announced iOS support for developers and debuted Google Expeditions, which lets students take virtual trips with Cardboard to places like the moon and underwater. We also shared a preview of Jump, which lets you capture the world in video that you can step inside of. The first billion users of the Internet came online through desktops. The next billion are taking a different path to computing—coming online through mobile and smartphones—and present a unique set of opportunities and challenges. We’re working hard on ensure these people have a great experience across our products. In addition to making devices more affordable with Chromebooks and Android One (now in seven countries), we’re making changes to ensure that our software works even where there aren’t great Internet connections. We’ve launched a streamlined version of our Search results page in 13 countries, and 73 million people now use data saver mode in Chrome to browse the web more efficiently. Finally, we previewed the new offline maps—that’s right, and it’s as simple as it sounds—maps that you can take offline, even with turn-by-turn directions. From our earliest days in Search, our aim has always been to build products for everyone, applying unique technical insight to tackle big problems. That’s just as relevant in today’s mobile-centric world—from finding the information scattered across apps, to helping someone organize and share the photos of their kids; from taking people on a virtual trip to the Pyramids to helping the next billion people come online. And by providing a platform on top of which any developer can innovate, we can reach people around the world and put the power of the Internet in their hands—no matter what device they use, where they live or who they are. So here’s to the mobile revolution. We can’t wait to see what comes next. This morning, more than 6,000 developers descended on San Francisco’s Moscone Center to burn through 1,500 gallons of coffee and join millions of others via live stream for our 8th annual Google I/O—a time to fill people in on what we’ve been building recently, and how we’re tackling the future.